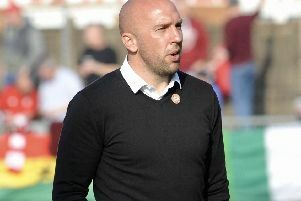 Worthing Football Club joint manager Gary Elphick spoke of his relief after his side halted a six game Ryman League Premier Division losing streak on Saturday. A first senior goal for 17-year-old Charlie Williamson and a debut effort from Dan Summers helped Worthing twice come from behind to seal a 2-2 draw at Harrow Borough. Elphick felt the point was well deserved following a much-improved display from his team, though, he believes both goals conceded were avoidable. He said: “We just wanted to stop the rot and we’ve finally managed to do that. I gave the boys a bit of a rollicking at half-time but the response in the second was superb. “That was the sort of game we’d have folded in a few weeks back, so to come from behind twice showed great character and it gives us the opportunity to turn things around now. Having suffered their heaviest home league defeat at hands of Harrow last month, Worthing were eager to put that 4-0 loss right. Harrow were off to the best possible start, taking the lead inside five minutes. Francis Babalola was allowed too much time on the ball, before he struck a sweet left-foot effort into the bottom corner. Williamson’s first senior goal for Worthing hauled them back level on the half-hour. Having worked so hard to get back level, Worthing fell behind for a second time four minutes before the break. Andy Lomas’ cross was met by Marc Charles-Smith, who rose above two opposition defenders to net his first goal of 2017. Worthing were gifted a way back into it on the hour. Harrow goalkeeper Luke Williams spilled a cross with Summers on hand to poke home a debut goal. After fighting back from behind twice, Elphick is hopeful this kick starts a revival for Worthing now. In the previous two games, Will Hendon and Jack Cook have started in defence together following substantial time-out through injury. Worthing joint boss Elphick believes having those two back in defence will be massive for the final eight games. He added: “When we had that 14-game unbeaten run earlier in the season both Jack and Will were massive influences in that. “It’s a relief to have them back fit and firing for us again. They’ll will be massive for us in the final few games of the season, I’m sure of that. Worthing welcome Lowestoft Town to Woodside Road in the league on Saturday. Skipper Kane Wills is suspended for the fixture. WORTHING: Thorp; Hendon, Cook, Heath, Rents; Williamson, Edwards, Wills, Sparks; Clark, Summers. Subs: Waller (Edwards, 61), O’Neill (Williamson, 62), Herbert (Waller, 86), Watson, Belward.